The emerging hypothesis is that by examining the nature of gray-level transitions in medical images, we can extract a subset of textural features, or what Tourassi8 referred to as a “texture signature,” that will best characterize the pathology or disease process of interest. Texture analysis has already demonstrated considerable potential in neuro-MR imaging as an objective strategy for lesion segmentation and characterization, particularly in cases in which the lesions are inseparable on the basis of standard T1, T2, proton-attenuation, or diffusion-weighted imaging, as will be discussed in this review. Additionally, texture may assist in scenarios in which robustness is particularly desirable, such as in monitoring disease progression or in the longitudinal evaluation of emerging therapies. We begin this review by providing a recipe for performing texture analysis, followed by a brief survey of its applications to neuro-MR imaging. Texture analysis is tremendously versatile and can be applied to virtually any digital image. If the spatial extent of the lesion can be identified by an independent means, then the application of texture analysis can be restricted to a set of predefined regions of interest (eg, lesion versus “normal” or contralateral reference). In the selection of image region of interest or image size, the investigator or analyst will have to balance the need to capture sufficient textural information for classification purposes with the desire to avoid including objects that span multiple tissue categories.9 The flowchart provided in Fig 1 outlines the general strategy for implementing texture analysis, regardless of whether regions of interest or whole images are selected. Numerous approaches to the quantification and characterization of image texture have been proposed, with most textural features falling under 3 general categories: syntactic, statistical, and spectral. Syntactic texture analysis identifies fundamental or “primitive” elements of the image, which are then linked through syntax.10 Although it appears to show potential for brain surface mapping and volumetry,11 to the best of our knowledge, there have been very few reported applications of syntactic texture analysis to neuro-MR imaging, so we will focus primarily on statistical and spectral approaches. Fortunately, virtually all of the features discussed herein can be evaluated with freely accessible software or programming tools, (eg, the OpenGL tool MaZda; Piotr M. Szczypiński, Institute of Electronics, Technical University of Lodz, Lodz, Poland). Formulas for all of the statistical features discussed herein are provided in the Appendix. Readers will immediately recognize the first-order statistical features (On-line Table 1, Appendix),9 particularly MGL and VGL, because these are routinely quantified directly on the console and are self-explanatory. The remaining 3 first-order features refer to gradient parameters that characterize local gray-level differences. The second-order statistical features are extracted from GLCMs and RLMs, respectively. In brief, a GLCM is constructed by systematically considering the relationship between pixel pairs and tabulating the frequency of various gray-level combinations within an image or within a region of interest (On-line Table 2, Appendix).9 The maximum number of gray levels considered for each image or region of interest is typically scaled down to 32 or 64 levels, rather than using the full dynamic range of, for example, 65,536 gray levels (16 bits/pixel). 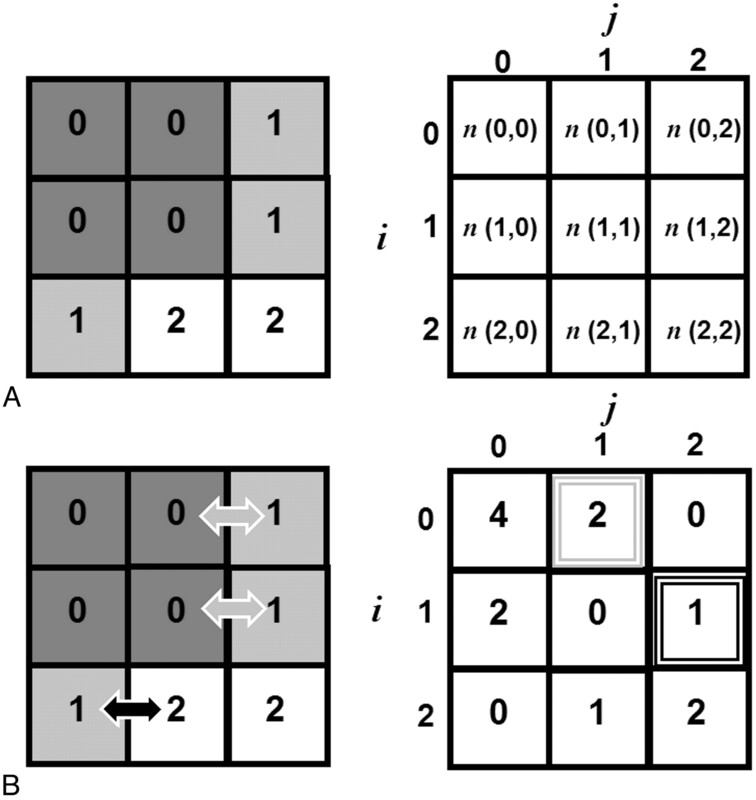 This quantization step is required to avoid a large number of zero-valued entries in the co-occurrence matrix (ie, sparse matrices).12 Figure 2 provides a schematic guide to the construction of a single GLCM of a hypothetic 3 × 3 pixel image. Given an image f(x,y) with a set of Ng discrete gray levels, the matrix hdθ(i,j) is defined such that entry (i,j) is equal to the number of times that f(x1, y1) = i and f(x2, y2) = j, where (x2, y2) is the sum of (x1, y1) and (dcosθ, dsinθ). A GLCM is computed for each distance, d = 1, …, n pixels in each direction, θ (eg, θ = 0°, 45°, 90°, and 135°). Fourteen textural features can be extracted from each 2D GLCM for each combination of d and θ (On-line Table 2, Appendix). In a similar manner, run-length features can be computed to evaluate the coarseness of a texture in a predetermined direction.13 A gray-level run consists of a set of consecutive collinear pixels in a given direction, θ. The RLM is constructed such that Pθ(i,j) is the number of gray-level runs j pixels long for a given gray level, i. The usefulness of run-length features relative to GLCM or even first-order features has been the subject of some debate. Early comparison studies14,15 suggested that run-length features are the least efficient texture features relative to GLCM, gray-level difference features, and features derived from spatial-frequency power spectra. A more recent comparison, however, found that run-length features performed comparably well with those derived from GLCM and were superior to wavelet features for the identification of 16 images from the VisTex texture data base (Massachusetts Institute of Technology, Media Laboratory, Cambridge, Massachusetts).16 Formulae for run-length features are provided in On-line Table 3 of the Appendix. With the possible exception of features that are extracted from parametric T1 or T2 maps, we would strongly advise that GLCM and RLM features undergo normalization at this stage (eg, dividing each entry in the GLCM or RLM by the total number of matrix entries).17 This step will facilitate interscan comparisons, not only between subjects but also for longitudinal evaluations of the same subjects. The classification of textural features is analogous to a radiologist's clinical interpretation and involves partitioning the streamlined feature space according to tissue class or diagnostic category. Classification is typically accomplished by using a decision or discriminant function. Provided that the feature space is multivariate normal, supervised classification can be performed by using the Bayesian decision theory or linear discriminant analysis with a distance classifier (often the Mahalanobis distance26). Supervised classification of nonparametric data can be accomplished by using decision trees, k-nearest neighbor,27 support vector machines,28 or neural network29,30 techniques. The accuracy or success of our feature classification strategy is generally evaluated by cross-validation, beginning with dividing the data into training and testing subsets, performing the classification on the training set, and then validating the results of the classification on the testing set. If we then re-partition the original cases and repeat the procedure, we can ultimately use the average classification accuracy as our overall validation metric. We can also construct a logistic regression model by assigning the most discriminating features as predictors and either tissue class or diagnosis as the outcome measure.31 The classification accuracy is then calculated by measuring the area under the ROC curve. We should also note that unsupervised classification techniques including K-means or hierarchical clustering32 are suitable for scenarios in which there is no prior knowledge of how the feature space is organized; therefore, all cases belong to a single testing set. Textural features may complement the macrotexture information already used by radiologists, such as the organization of lesions within normal brain parenchyma. In the following section, we will attempt to illustrate how texture analysis has been applied to the diagnosis and characterization of brain tumors, epilepsy, and MS.
One of the earliest neuro-MR imaging applications of statistical texture analysis was the characterization of brain tumors.17,33 This remains a particularly important problem because there can be substantial intersection between the T1 and T2 of benign and malignant brain tumors,34–36 which complicates lesion characterization with conventional MR imaging. Lerski et al17 were the first to report an MR imaging texture analysis procedure for identifying tumor constituents in their 1993 feasibility study of 12 patients with intracranial tumors. The authors combined first-order histogram, gradient, and second-order GLCM features (f1, f2, f3, and f9) as extracted from T1- and T2-weighted spin-echo MR images into a 4- layer hierarchical decision tree with stepwise discriminant analysis applied at each level to identify the features most capable of discriminating between and among tissue and tumor constituents (ie, CSF, WM, GM, solid tumor, and edema). The results of the 4-layer classification tree are depicted in Fig 3. 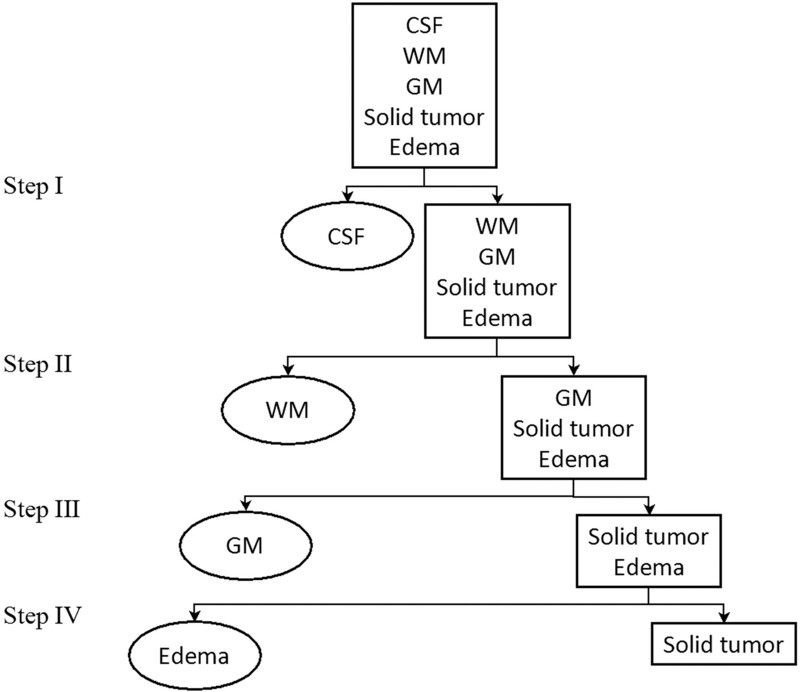 Mahmoud-Ghoneim et al37 were able to further stratify tumor constituents, identifying a separate texture class corresponding to peritumoral WM. The authors discovered that the specificity of GLCM features for the identification of tumor constituents could be improved by extending the evaluation of in-plane 2D interpixel relationships to include through-plane 3D relationships (ie, in a multiple-section volume). Compared with their 2D equivalents, the 6 GLCM features extracted from 3D noncontrast T1-weighted gradient-echo images were superior for discriminating between necrosis and solid tumor (sensitivity and specificity were each 100% for 3D versus 75% and 60% for 2D) and between solid tumor and edema (sensitivity and specificity were each 82% for 3D versus 60% and 55% for 2D). The objectivity of texture analysis depends on the assumption that images are acquired, processed, and analyzed under identical conditions. Herlidou-Même et al35 acquired standard T1- and T2-weighted images from 10 healthy volunteers and 63 patients with confirmed intracranial tumors and data acquired by using 3 different scanners to test the robustness of the technique. The authors were able to use the same statistical textural features to segment the tumors, irrespective of the acquisition parameters, scanner, reconstruction, or processing used, and reported highly reproducible results in a head-to-head comparison of second-order features computed from T1- and T2-weighted images of gliomas acquired with 3 different MR imaging scanners. With respect to multiscale or spectral features, Brown et al38 have suggested that the Stockwell transform is sensitive enough to distinguish among tumor genotypes, such as in the identification of oligodendrogliomas with a genetic signature associated with good outcomes. The spectral analysis of T2-weighted MR images with the Stockwell transform was more accurate than visual assessment, with a sensitivity and specificity of 93% and 96%, respectively, for delineating these particular tumor genotypes (compared with 70% and 63% for visual assessment). The authors cautioned that these results, while impressive, were obtained in a retrospective analysis and the technique will require further validation before clinical implementation. In a similar manner, Stockwell transform analyses of T2-weighted images have shown potential for identifying the patients with high-grade gliomas (glioblastoma multiforme) most amenable to therapy.39 Specifically, Drabycz et al39 compared visual assessment with the analysis of spatial frequency with respect to their capacity to identify the methylation status of a gene promoter associated with good chemotherapeutic outcomes. After examination of the Stockwell spectra for T2, FLAIR, and postcontrast T1 images, the authors found that the spectral features extracted from T2-weighted images were more specific markers of methylation status than visual identification of ring-enhancement (65% versus 39%) but at a loss of sensitivity (79% versus 93% for spectral and visual textural features, respectively). In addition to the morphometric and first-order features used in Bernasconi's work, Antel et al44 also calculated 3D GLCM features. The authors acquired T1-weighted MR images from 18 patients with FCD and 14 healthy controls. Voxels were initially classified as “lesion” by a Bayesian classifier that was based on morphometric and first-order features. Lesion voxels were then subjected to a GLCM-trained classifier constructed by using the Fisher discriminant ratio. 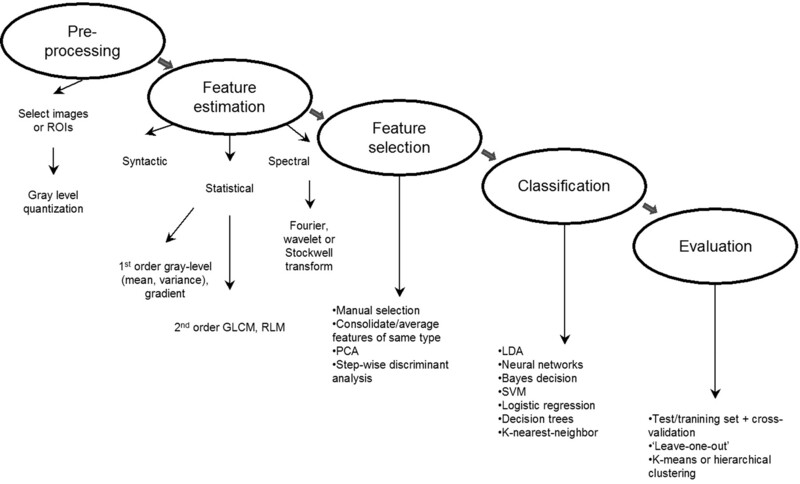 The 2 classifiers ultimately selected 3 features (f1, f2, and f11) from among the 9 features evaluated. Although both visual analysis and Antel's twin classifier had perfect specificity, the latter also had a sensitivity of 83% for the identification of FCD lesions compared with 61% when performed by using the standard visual assessment of MR images. As indicated earlier, the other objective of the MR imaging protocol for epilepsy is to obtain high-resolution images of the hippocampi and the temporal lobes.40 Hippocampal sclerosis is a common finding in temporal lobe epilepsy.45 Identification of hippocampal abnormalities is of substantial interest, however, particularly with respect to surgical planning. Yu et al45 evaluated >200 texture features extracted from proton-attenuation and T2-weighted images of the hippocampi of 23 patients with unilateral temporal lobe epilepsy and in 9 healthy controls. The correct identification of hippocampal sclerosis with proton-attenuation MR images was achieved by using f9 and f3, whereas a total of 9 T2-weighted MR image features were able to correctly classify the hippocampi. In a subsequent study, Sankar et al46 discovered decreased gradient and f9 features in patients with epilepsy, connoting a blurring of the temporopolar WM (65% sensitivity and 100% specificity for hippocampal atrophy versus 17% and 69% with visual assessment). Using histologic evidence of hippocampal sclerosis as the ground truth, Bonilha et al47 evaluated several statistical textural features extracted from T1-weighted MR images acquired from 19 patients with mesial temporal lobe epilepsy. Multivariate analysis of variance isolated 8 potentially discriminating features that were subsequently submitted to post hoc analysis. Almost all 8 were capable of discriminating between sclerotic and healthy hippocampi. Furthermore, the authors reported no difference between ipsilateral and contralateral hemispheres in the patients with epilepsy. Although we would not recommend discarding features prematurely or arbitrarily, it is clear that the authors could have benefited from further data-reduction techniques (and they acknowledge this limitation). In this context, we would recommend the approach reported by Freeborough and Fox48 in their MR imaging texture study of patients with Alzheimer disease. Their initial set of features was also quite large (n = 260), so the authors first reduced the dimensionality of their feature space by averaging features for all 4 directions. Then, their consolidated features were subjected to stepwise discriminant analysis by using the forward selection method based on the Mahalanobis distance between controls and cases in the training set and iterated until none of remaining features significantly increased the decision distance. Texture analysis has been proposed as an alternative strategy for identifying active MS lesions and monitoring disease progression. For example, Yu et al52 discovered that texture analysis of standard T2-weighted MR images could discriminate between active and nonactive lesions in a study of 8 patients with RRMS (4 with active lesions), suggesting that this technique could be used to minimize or perhaps even obviate gadolinium-based contrast. Specifically, the authors evaluated 42 first- and second-order statistical textural features and performed LDA to classify lesions into active and nonactive groups. Applications of the run-length method have been very limited compared with other methods, yet Yu et al found that RLM features actually outperformed GLCM features in the identification of active MS lesions, with RLM features distinguishing active from inactive lesions with 88% sensitivity and 96% specificity. Conversely, none of the GLCM features provided any discrimination between lesion subtypes. While acute gadolinium enhancement is currently used as a marker of active inflammation or lesion development, chronic MS lesions are conventionally identified and counted by using T2-weighted imaging.53 However, T2 hyperintensity is not particularly specific for MS and appears to be unsuitable for identifying incremental changes in NAWM with time.54 Zhang et al23 investigated >200 texture features extracted from the T2-weighted MR images of 16 patients with RRMS. The authors selected features on the basis of the greatest difference between tissue classes (ie, MS lesions versus normal WM, MS lesions versus NAWM, and normal WM versus NAWM). The 9 features showing the largest differences and those that were common to all 3 tissue class pairs were subjected to PCA followed by classification by using ANN. Although the combined set of features outperformed the authors' GLCM-only classifier for distinguishing MS lesions from normal WM (100% versus 92%), it was relatively unsuccessful at discriminating normal white matter from NAWM (58% versus 67%). More recent MR imaging studies by using magnetization transfer imaging and, specifically, the MTR can quantify demyelination severity, because MTR is reduced in WM lesions55 with milder decreases also observed in NAWM and GM.56,57 Tozer et al58 estimated GLCM textural features extracted from magnetization transfer MR images acquired from 23 healthy controls, as well as from 32 patients with RRMS, 3 patients with SPMS, and 38 patients with CIS, and investigated the relationship between textural features and the Expanded Disability Status Scale. While the authors found no differences between the features extracted from controls and patients with CIS, several features differed between patients with MS and the 2 other groups, especially in GM (but also in WM). Disability scores also correlated significantly, if modestly, with GLCM textural features extracted from GM regions. Texture feature abnormalities in MS suggested there might be tissue damage beyond classic WM lesions and that these features show potential for quantifying the severity of demyelination. Whereas GLCM and other statistical features appear to be better suited for identifying active lesions, recent work suggests that spectral texture features may offer greater sensitivity for monitoring disease progression and evaluating treatment response. Zhang et al54 recently measured the spatial-frequency content of T2-weighted MR images acquired from 20 patients with RRMS who participated in a multicenter clinical trial of oral glatiramer acetate. Participants in this study were scanned every 2 months for 14 months. Low spatial-frequency content, as assessed by a modified Stockwell transform, increased in active lesions, followed by a recovery to normal. This low or “coarse” spatial-frequency content appeared to increase in chronic lesions, coinciding with (but not necessarily reflecting) the fact that inflammation and demyelination continue to be observed in chronic MS lesions.59 The total low spatial-frequency content appears capable of predicting lesion development in disease-prone (normal-appearing) WM tissue. At present, thrombolysis with rtPA is the only treatment available for AIS, yet its use is limited to patients presenting within 4.5 hours of onset, due to the risk of HT.60 Techniques are clearly needed for the early prediction of hemorrhagic complications. Given the findings reported for MS studies and assuming that the blood-brain barrier disruption before HT is similar in degree to that occurring in acute MS,61 we hypothesized that there would be differences in the complexity and homogeneity of HT-prone stroke infarcts. To this end, we evaluated first-order (MGL, VGL) and 4 2D-GLCM texture features (f1, f2, f3, and f9) as extracted from postcontrast T1-weighted spin-echo images acquired from 34 patients with AIS.25 Contrast and correlation (f2 and f3) were the only 2 features capable of predicting HT and were much more sensitive predictors than conventional visual assessment of postcontrast T1-weighted images. Surprisingly, the addition of visual enhancement to either f2 or f3 did not significantly improve accuracy. As previously discussed in the context of brain tumor imaging, the specificity of statistical texture analysis can be improved by extending the evaluation of in-plane pixel interrelationships to include through-plane relationships.37 Woods et al62 recently combined 3D GLCM analysis with DCE imaging of breast lesions. By examining the time-evolution of contrast enhancement, in which time constitutes the fourth dimension, the authors reported impressive differentiation of benign and malignant tumors, which may prove instructive in future neuro-MR imaging applications. Like texture analysis, DCE-MR imaging has shown considerable promise in the characterization of blood-brain barrier integrity in brain tumors,63 MS,64,65 and AIS.66,67 Unlike conventional DCE, however, the approach of Woods et al62 requires no pharmacokinetic modeling. Rather, textural features are computed at each movement of the analysis window through the 4D dataset—that is, first from the left to the right of the patient, second from inferior to superior, third from posterior to anterior and finally, the window is moved from pregadolinium injection to the final acquisition in the DCE dataset. In most of the studies reviewed, the feature classification step was accomplished by some flavor of LDA. While LDA is a reasonable strategy for addressing this issue, further sophistications in feature classification have emerged from the fields of artificial intelligence and machine learning. In the original 4D texture analysis study, Woods et al62 developed an ANN classifier and trained it to classify the DCE data into benign and malignant tissue classes. Apart from 4D texture, others have developed ANN23,29 as well as probabilistic neural network classifiers68 to isolate the most discriminating textural features. Although neural network approaches initially require a great deal of data for training and validation, once this stage has been completed satisfactorily, these procedures could be implemented in a clinically reasonable timeframe. Others have very recently applied support vector machines to discriminate between and among intracranial tumors, delineating metastases from gliomas and high-grade from low-grade gliomas with high diagnostic accuracy,28,69 but a more detailed discussion of this approach is beyond the scope of this review. Texture analysis is a potentially valuable and versatile tool in neuro-MR imaging. While we have attempted to emphasize the potential pitfalls, such as statistical overfitting, there are many options for coping with texture datasets. We should also maintain realistic expectations of what is essentially a set of mathematic constructs, and in most applications, the pathophysiologic interpretation of textural features remains an open question. As such, texture analysis will likely play a supportive rather than a comprehensive role in the future of medical image interpretation. In some cases, however, statistical or spectral textural features have outperformed visual assessment in discriminating between or among intracranial tumors, as well as in discerning subtle anatomic changes associated with a high risk of seizures in patients with epilepsy. The robustness of texture analysis makes it particularly attractive for monitoring disease progression or treatment response with time, as demonstrated with MS. This work was supported by the Canadian Stroke Network, the Canadian Institutes of Health Research, and the Canada Research Chair Program. Accepted after revision December 18, 2009.